You can track opens, clicks, and downloads, so you'll know exactly how your recipients are interacting with your messages. You can set up tracking for each individual email. In the Compose window, you can turn tracking on (or off) by clicking the Track button (the lightning symbol) on the bottom bar. 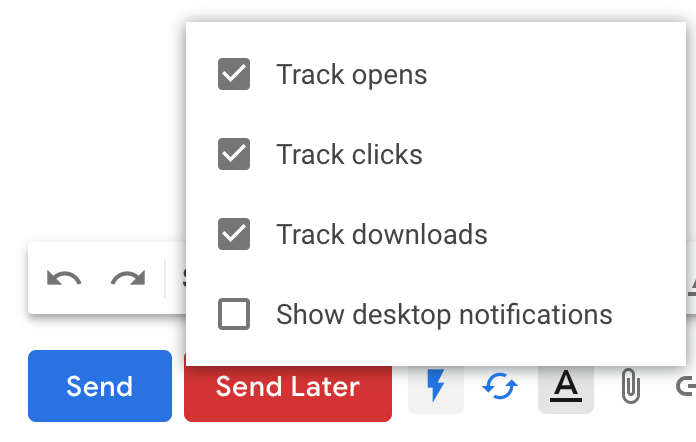 Hover your cursor over the Track button to turn on/off tracking for clicks and downloads (available on the Small Business plan and above), and to turn on/off desktop notifications for this particular email. 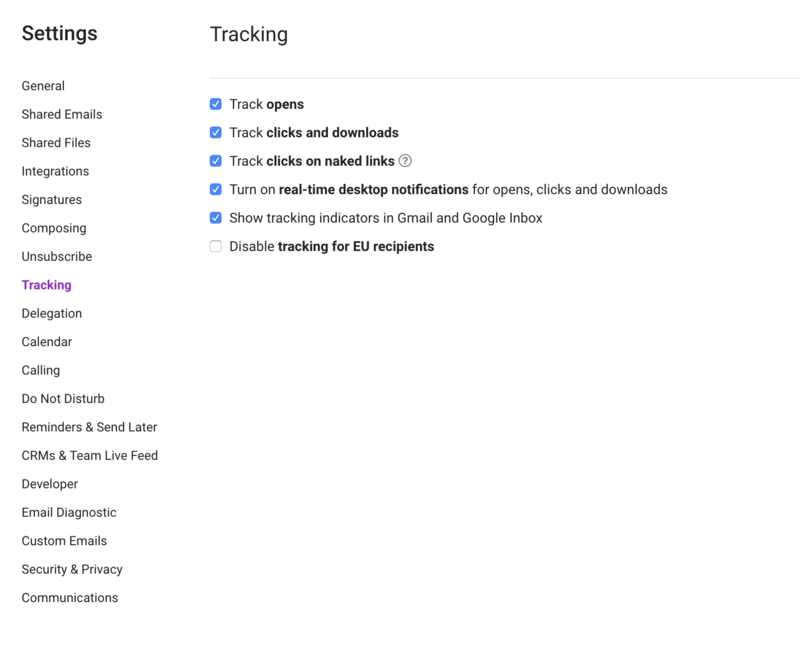 You can set your preferences for email tracking in Settings. Click the Mixmax icon at the top of your Gmail page and select Settings to open the Settings page in a separate tab. Go to the section on Tracking, as per the screenshot below. Track opens: Know exactly when your email is opened. Track clicks and downloads: Know when someone clicks a link or downloads a cloud-hosted attachment. Available on the Small Business plan and above. Track clicks on naked links: Un-check this box to improve the deliverability of your emails. Turn on real-time desktop notifications: Check this box to receive a desktop notification each time an email is opened, clicked, and downloaded. Show tracking indicators in Gmail or Inbox: Have the tracking lightning bolts visible for every tracked message in your Sent Mail folder. Disable tracking for EU recipients: To help you comply with the European Union’s GDPR privacy law, you can disable tracking for recipients in the EU. Your Live Feed is a stream of activity that shows how your recipients are interacting with your emails. You'll see each open, click, and download event. You can filter to look only at Unopened, Opened, Clicked, or Downloaded events by clicking those buttons in the top bar. On the Small Business plan and above, you can also track Replies. You can search by sender, recipient, sequence, template, activity, or dates sent in the search bar at the top. If you're on the Free and Starter plan, your Live Feed (and Sent folder) shows events in the past 30 days. If you're on the Small Business plan or above, your Live Feed by default shows events for messages that have been sent in the last 30 days, but you can see much further back in time (we're working on making this infinite) by deleting "sent:last30days" in the search bar and searching again, or by specifying your own dates. All prior events are shown in your Sent folder (see below). Find an email in your Gmail (or Inbox) Sent folder and take a look at the lightning bolt. A grey lightning bolt indicates that no one has opened your message. A blue lightning bolt indicates that the message was opened — hover over the lightning bolt to see details on who opened and when. You can see tracking details if you're on the Starter plan or above.